Birding Corvo 2009: New species for Corvo again! Decided to bird around the village today, which turned out to be a wise decision. Rather strong winds from the east were blowing so I decided to try a little seawatching. Went up the small lighthouse next to the airport and sat down behind it. 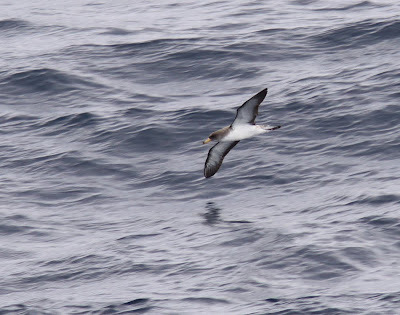 Loads of Cory's were moving in the wind and within a minute I had spotted my first Great Shearwater for the day. An hour and 15 minutes later I had counted 24 of them and since all shearwaters were flying further out I left and checked the shoreline instead. Not much to see at all, only saw the Bar-tailed Godwit, a Sanderling and five Turnstones. I wonder where the Turnstones are some days! Here are about 30 around so they must be hiding somewhere else. After checking the beach I went up to the rubbish dump to have a look at the gulls and it was actually quite nice up there today. 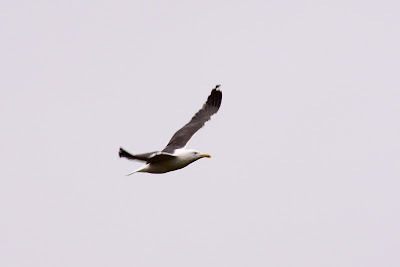 Something like 50-100 gulls were around and easy to check. 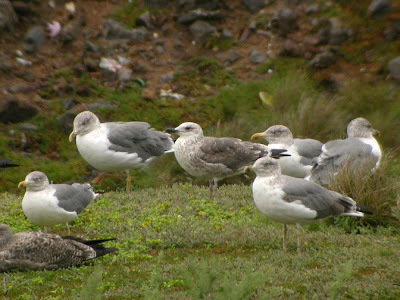 Found three Lesser Black-backed and two Greater Black-backed Gulls among the Yellow-legged. 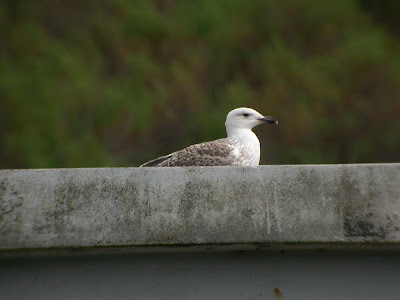 Ring-billed Gull in a month or two? When I was on my way to check around the village for landbirds I suddenly saw a big grey wall coming towards me from Flores - RAIN! Quickly packed my bag and walked back to the guesthouse. Got a little wet but not very much. The rain then continued for four hours so I had time to have lunch, take a nap and hang around the Internet for a while. When the rain stopped I decided to have an early evening walk around the airfield. Took a short scan over the sea from behind the lighthouse again and loads of Cory's were moving since the wind had increased. When I lifted my eye from my scope I saw something coming flying towards me from west - A DUCK!!! Every duck out here is a good duck and this was the first time I saw one outside the crater. As the bird was going to fly by me at sea I had to make a fast decision - scope or camera? Within half a second or so I had started to change the settings on the camera and soon I was taking poor pictures of the bird in flight. Through the camera I could see it was a male Pochard type, interesting! 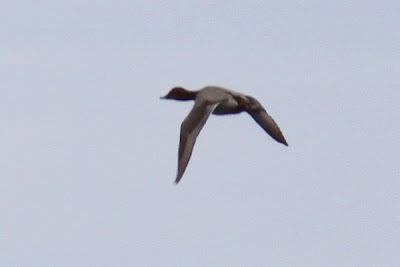 When the bird flew out of camera range I grabbed my scope and couldn't see anything that suggested it wasn't a Pochard. When checking the pictures afterwards I could confirm the identification. 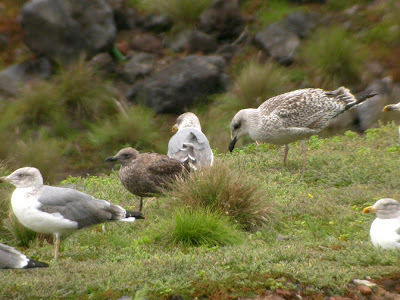 This was the first record for Corvo and the first record since 2005 on the Azores, so quite a good bird! I was looking the picture of the duck and I was surprised by the structure of the round head! later the dark grey backs and notable contrast of the primaries and secondaries with the coverts and greater primary coverts I think in a Redhead (Aythya americana). I don't have experience with this bird because I've never seen before. Thanks for the comment Ferran! I didn't know about the wing pattern feature. But I still think the bird is a Common Pochard due to the head shape and the little you can see of the bill pattern. Will post some new pictures of the bird soon where I think the head looks more typical. See you in a week! I agree with Olof, this looks like a Pochard. My opinion on this photo is that the light conditions is a bit tricky and the apparent contrast between pri/sec´s and coverts looks moore like a effect from the hard light. Note that the black primary tips, that usually contrasts very clear against the grayish inner part of the prims, dont show very clearly in this photo (but you can see it´s there). I have no opinion on the bill pattern, but I think that the shape of the head looks very good for Pochard - I´ve only seen about 20-25 Redheads (but loads of Pochards) - the head of the bird on the photo have, in my opinion, a quite angular head shape and not the smooth round shape, without any "angles", that a Redhead would have. I´m no expert in this - far from it, but as Í wrote, I agree with Olof - I too think it´s a Pochard. Thanks for the comment JonnyT!